Growing up, I remember being surrounded by books, there were bookshelves in the hallways, in the kitchen, in the laundry room, pretty much on any wall that could hold a bookshelf. This is my virtual space for books that I always want access to, to the books that changed my life and my thinking, the books that are worth having with you all the time. This list is my permanent collection. I'll update it as I come across books that I feel should go on the list. "Made to Stick": A primer in understanding why some ideas "stick" in the minds of your audience. Just a great fun read, anything by the Heath brothers is worth picking up, good stories and practical tips. 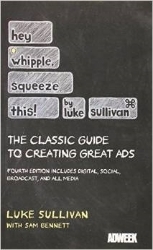 "Hey Whipple Squeeze This": When some asks me to recommend one book on advertising, its this one. Key walkaway: being memorable isn't the same as being liked. "Moneyball": If I could I would put any of the original Bill James Baseball Abstracts on the list, but they're not in print, and they're pretty baseball-centric, which is a shame because they were my initiation into thinking like a troublemaker. Moneyball, by the incredible Michael Lewis, tells the story of Bill James through his instrument, Billy Beane. This book is more than a story about baseball or statistics, its a story about institutional change, a story about how a troublemaker can change an industry. Along similar lines, I'd also recommend "The Insurgents" which tells a similar story about David Petreous and how he changed the way the Army fought the wars in Afghanistan & Iraq. "Writer's Journey": If you've never heard of Joseph Campbell then this is the book for you. If you've heard of Campbell, but never read his work, then this is the work for you. Heck, even if you read Campbell (which I have) this is the book for you. Christopher Volger takes Campbell's ideas about the mono-myth (essentially how all stories and myths follow the same structure) and turns it into a readable and accessible guide to storytelling. "Predictably Irrational": A great introduction into the world of behavioral economics. Where traditional economics espouses the rational model of human behavior (a person will act in their own self interest and make rational decisions to maximize self-interest), behavioral economics challenges that idea. It looks at how people really act and behave, and concludes that we are irrational creatures. 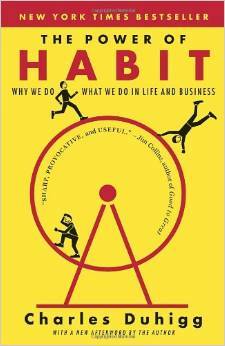 As the title suggests all is not chaos because people act in predictably irrational ways, read this book to learn them. "Buying In": This book helped me to realize that the act of buying or voting, that the choices we make are less about practical value or the rationalizations we provide, and more about our own personal narratives. That's an important realization for anyone in the field of influence or persuasion. "Power of Habit": Forget the NSA, be worried about the data companies like Target and others are collecting on us. This book was another life changing or perspective changing book for me. We only have so much willpower (a lot less than we think we do), to change our behaviors or start a new routine (working out, stop smoking, whatever), don't rely on willpower, make it a habit. "Shortcuts": There are other more scholarly books on metaphor, but this one is by far the most accessible and readable. "The metaphors we use matter because metaphors have baggage." We're so accustomed to speaking (and thinking) in metaphors that we tend to take them for granted, which is both dangerous and leave us susceptible to being manipulated. "A Whole New Mind" & "Drive": Dan Pink rules. "A Whole New Mind" was so mind blowing when I read it almost 14 years ago. It helped me coalese so many ideas that had been rattling around my head on how to approach the world. In a nutshell we should focus less on hard skills and more on "soft" skills like design, storytelling, empathy, collaboration, meaning, fun. "Drive" is an equally mind blowing look at motivation, and its not what you think. "Mindset": Why should praise a child's effort and not their intelligence? It comes down to cultivating a growth mindset v. a fixed mindset. 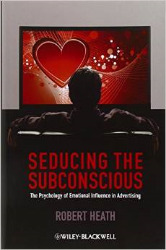 "Seducing the Subconscious": This book is little more technical and focused than some of the others, but worthwhile nonetheless. It gives a novel understanding of how ads work on our subconscious mind. We all worry about getting a viewer's attention, but is attention all its cracked up to be?